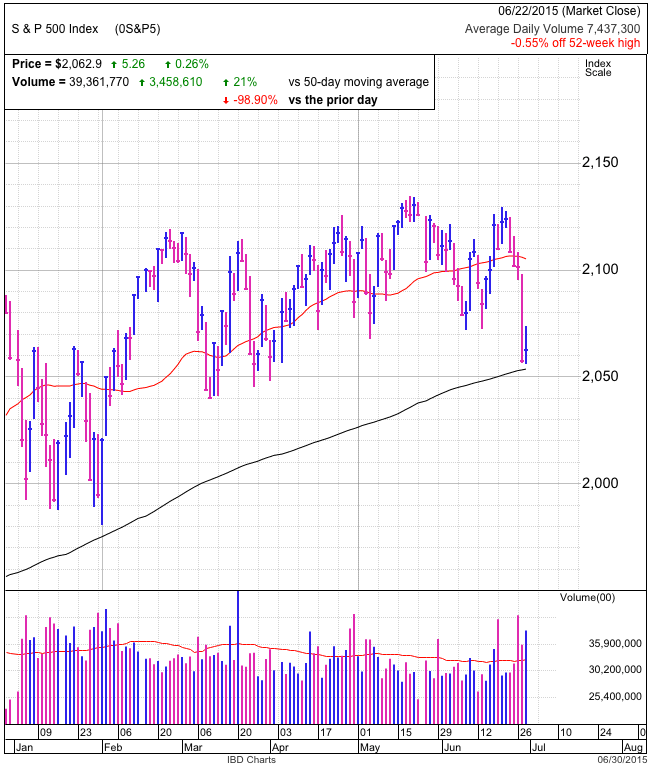 Monday’s one-way selloff took a break Tuesday as we bounced modestly off the 200dma. The S&P500 reclaimed 2,070 twice through the day but was unable to hold those gains and closed closer to 2,060. Volume was even higher than Monday’s selloff as waves of nervous owners sold to eager dip-buyers. Greece continues to dominate headlines, but now some are claiming Puerto Rico is the bigger contagion threat. I don’t see it, but if the extra excuse helps people rationalize their emotional trading decisions, then good for them. 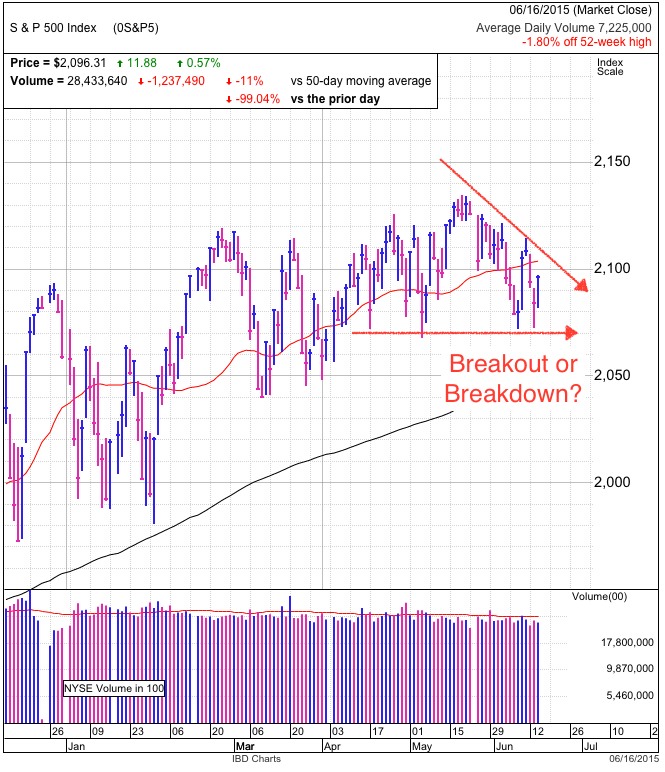 Technically we still find ourselves above 2,050 support and the 200dma. Both levels provided meaningful support since late last year and that was enough for buyers to rush in and buy the dip. The risk is emotional selloffs typically end when we run out of emotional sellers. Today’s modest gains on elevated volume show there is still a decent number of sellers bailing out of this market. More interesting would be a low-volume bounce since that tells us we finally exhausted the supply of available sellers. Conventional wisdom claims we want to see a high-volume rebound, but given all the headline uncertainty, don’t expect aggressive buying to save the day. The way Greek politicians are handling the situation, a rational person wouldn’t expect a compromise since inmates are running the asylum. 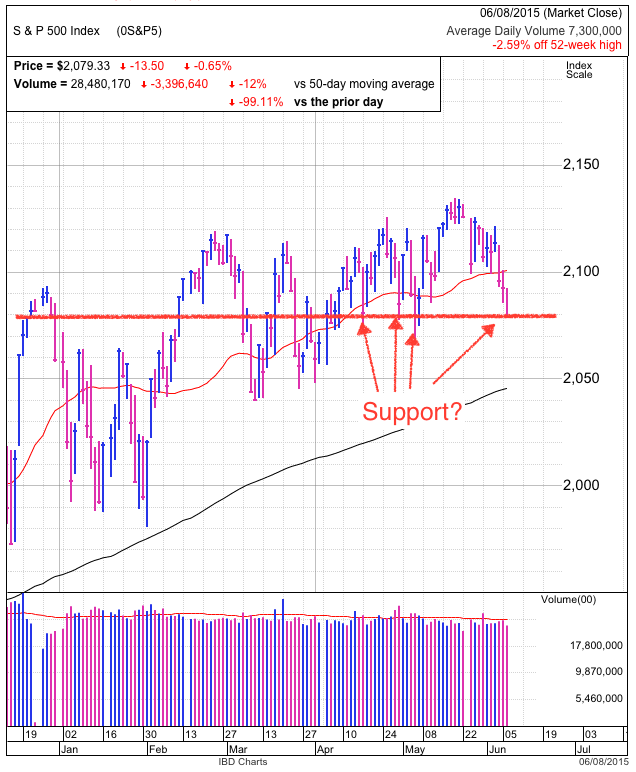 The most encouraging trade would be holding 2,070 support over the next couple of days. That period of calm allows traders to make more rational decisions. The risk is if we slip under 2,050 and the 200dma, triggering another wave of reactive selling. I’m not encouraged by today’s high-volume, weak trade and it seems like prices still want to go lower. But even at the risk of further weakness, this is still a better time to be buying than selling. Stay strong and resist the temptation to join the emotional herd of sellers. $AAPL – Apple struggles alongside the broad market and it will continue to trade weak until the entire market finds its footing. There is no reason to sell AAPL here, but not much reason to buy it either. 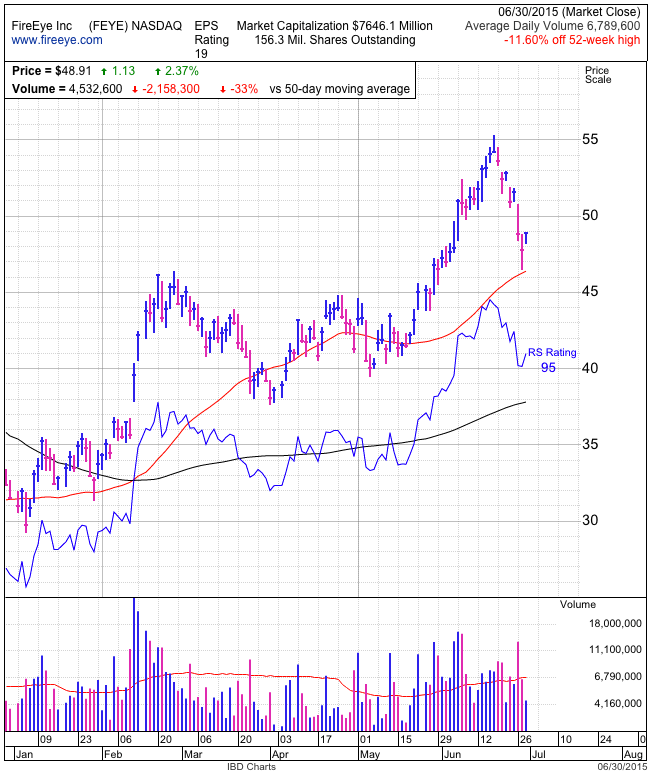 $EBAY – Ebay showed resilience around $60 support and the strongly rising 50dma. 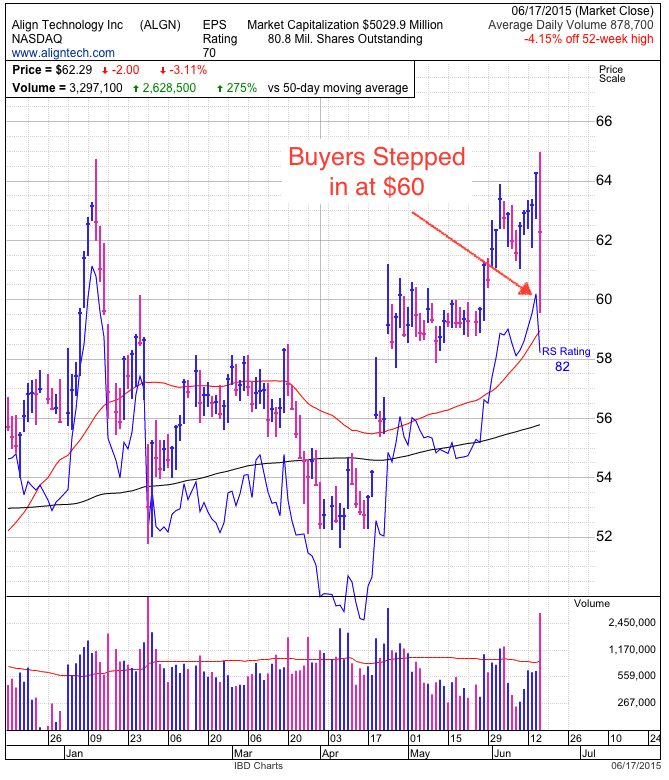 While all stocks are vulnerable to widespread selling, Ebay’s strength today showed many owners still believe in this story and are not ready to give up on it. $FEYE – FireEye also found support at its 50dma, but the stock has a larger hill to climb since it finds itself more than 10% off of recent highs. The faster the rise, the harder they fall and clearly that was the case here. It is critical to avoid high-fliers during volatile periods because their drawdowns will be multiples of more conservative stocks, but the reward will be equally impressive once the stock reclaims $50. $ALGN – Align continues trading well and is acting like it is immune to Greece all the other stories dominating headlines. This is definitely one worth keeping an eye on when the broad market regains its footing. Is it too late to sell? The S&P500 plunged over 2% as Grexit fears launched into overdrive. 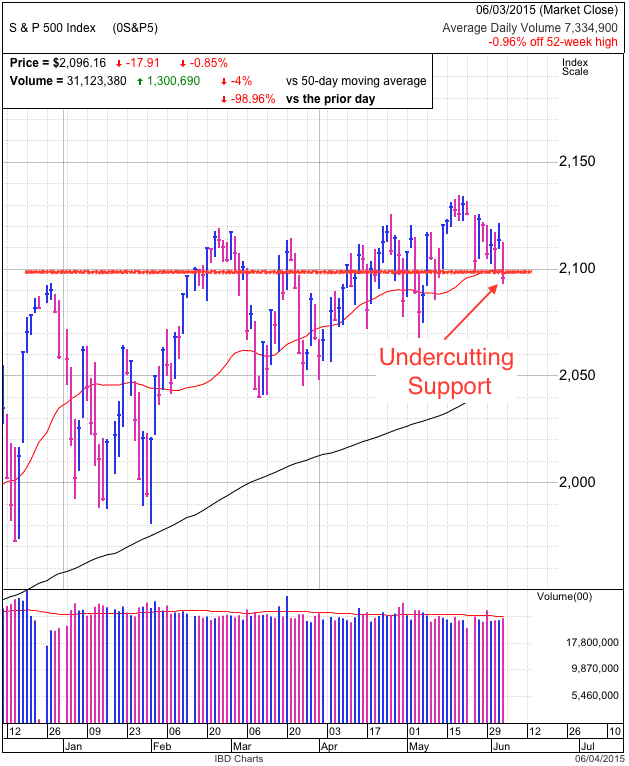 We smashed through 2,070 support and closed a hair above the 200dma. Volume was elevated, but surprisingly low for such a dramatic move. No doubt the holiday-shortened week contributed to this slower than expected volume. Of course it would be more accurate to state it the other way; our slower than normal week contributed to this outsized volatility. When big money is on vacation, markets are often less stable, especially when spooky headlines get involved. Two-weeks ago we traded near all-time highs when many investors assumed a Greek compromise was all but signed. This week we crashed to the lowest levels since winter as investors assume the Grexit is all but assured. This is a great example of why smart money trades against the herd. When everyone assumes the deal is done, then it is priced in and there is little upside remaining. That is the perfect opportunity to take profits and wait for the inevitable problems to arise. We’re in this to make money, not own stocks. The only way to beat this game is by taking profits when we are confident and don’t want to sell. Lets get one thing straight, the Grexit is a non-issue for anyone not living and working in Greece. Our financial system had five years to manage, hedge, and otherwise reduce exposure to a Greek default. Most Greek debt is now held by European governments who can weather these losses. For them it isn’t a big deal because they didn’t enter into these positions expecting a profit, or even their money back. All they were doing is buying stability and time. And given that they delayed the inevitable Greek default by five years, they did a pretty good job. While a few politicians might lose their jobs and damage their legacy over this, the financial system will survive without Greece because of the time they bought us. As for the markets, they are the most emotional when uncertainty is at its greatest. Many stock owners took a sell first, ask questions later approach to these headlines, offering their stock at a steep discount to anyone willing to take the risk. But as often the case, one person’s loss is another’s gain. The time to sell was two-weeks ago when we didn’t want to sell. Anyone with a longer-term view, today is the wrong time to sell. Resist the temptation to throw your trading plan out of the window and join the emotional herd rushing for the exits. For those lucky enough to be in cash, the best trades are the hardest to make. While we don’t want to recklessly buy every dip, we need to be prepared to jump in when everyone is convinced it will only get worse. That is the point where the last of the holdouts breakdown and hit the sell button. Once the last of the hopeful have given up, we run out of sellers and stop going down. Everything went down today because there is no safe harbor during an emotional dash for the exits. But once the anxiety passes, like it always does, the resulting price action will reveal which stocks are ready to lead the next leg higher. The stocks that fall the least and rebound the quickest show us who the true market darlings are because they’re stocks traders are most excited to own reluctant to sell. While it is a little early to be buying the dip, look for strong price-action and be ready to buy before everyone else does. 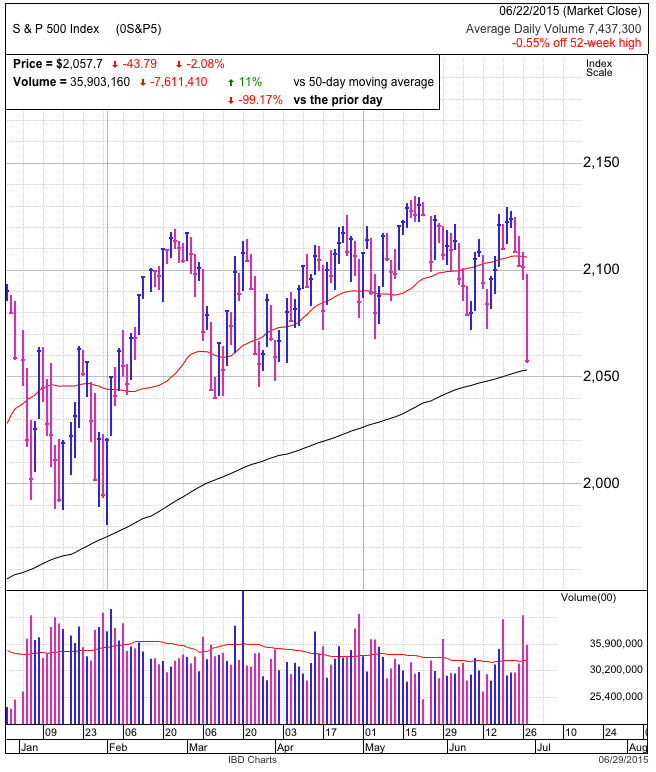 The S&P500’s indecisiveness continues as last week’s rebound turns into this week’s selloff. 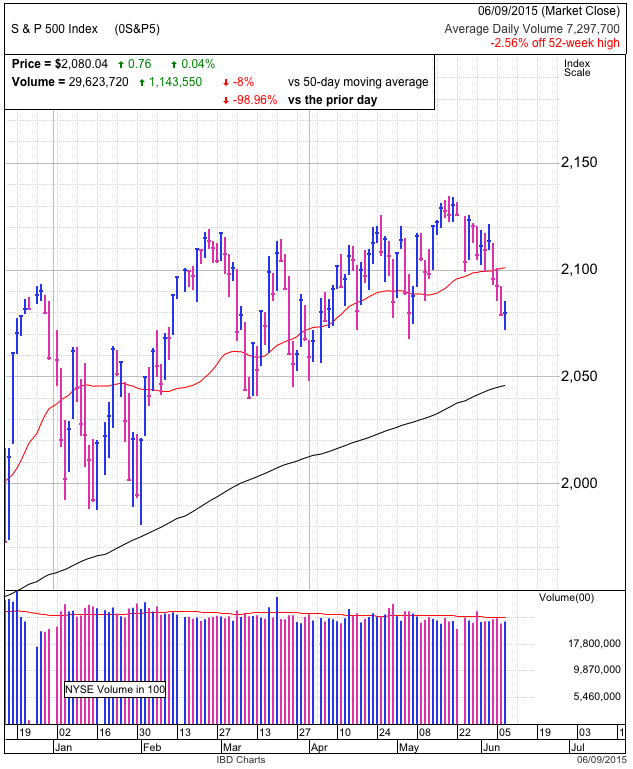 The index slipped back under the 50dma and closed just two points above 2,100 support. Volume was average, but higher than recent lethargic, summer trade. We received positive economic data and Obamacare news today, but Greece weighed on prices as another drop-dead date came and went without a resolution. The most noteworthy thing is for as fatal as Greek headlines have become, US stocks are proving incredibly resilient. The long feared Grexit has never been closer, yet we stubbornly remain within than two-percent of all-time highs. Hardly panic territory. There are two ways to explain this complacency. Market participants have grown tired of Chicken Little’s false alarms and are ignoring this round of Grexit fear mongering. Everyone who sold the Grexit Part 1, 2, and 3 came to regret that decision as prices rebounded to new highs not long after. Many of those investors won’t be fooled a fourth time and are holding steady in the face of increasingly ominous headlines because they know a last-minute deal is right around the corner. The other possibility is the market took a rational look at the risk posed by a Grexit and realized that with five-years of preparations, the fallout will have little impact outside of Greece itself. While I’ve written about the limited impact a Grexit for some time, I’m truly surprised the market is reacting so rational to this uncertainty. The challenge for the speculator is figuring out which scenarios is driving this complacency because that determines the direction we go when Greece finally defaults. If the market assumes Greece won’t default, the default will trigger a panic selloff. But if prices are holding steady because rational investors realize Greece doesn’t matter, then a Greek default will be old news by lunchtime. While don’t know what will happen next week, I know stocks are not being sold at a discount, meaning anyone buying this risk is not getting paid for it. As a trader I will happily hold risk for the right price. A few points from the highs is not a meaningful discount and is why I’m passing on this trade. $AAPL – Apple’s attempt to reclaim the 50dma failed for a second day as early strength faded into the close. There is no reason for long-term owners to abandon the stock, but it is hard to be excited about this price-action and the weakness will likely persist. 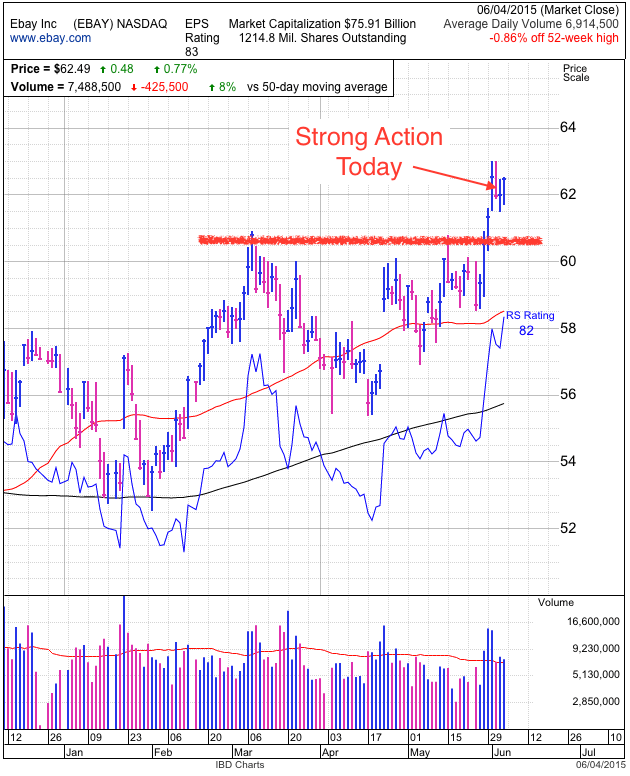 $EBAY – Ebay continues to trade well following its break above $60. While not a big momentum name, the stock is showing constructive strength by moving to multi-year highs ahead of the PayPal spinoff. $FEYE – FireEye is searching for support following this week’s 7% pullback from last week’s highs. $50 provided minor support in early June and is trying to do the same here. The risk is predatory traders pushing the stock under $50 to flush out all the defensive stops under this obvious stop-loss level. For those looking to get into FEYE, a break under $50 but then quickly reclaiming it could signal the capitulation bottom of this near-term pullback. $NFLX – Netflix stumbled from all-time highs after Carl Icahn revealed he closed out of his epically profitable trade. Upgrades, downgrades, and gurus hyping and bashing a stock don’t change the fundamentals. These statements are nothing more than one person’s opinion and their impact on a stock’s price is fleeting at best. There are many reasons to avoid NFLX, but what Icahn did with his position is not one of them. f you enjoyed this article, sign up for free email alerts and receive notifications when new content is published. The S&P500 ended in the green as traders anticipate an imminent Greek deal even though the two sides continue to wrangle. This half-full outlook is a material departure from recent crises. Previously the market would devolve into a downward spiral of emotional selling over any headline uncertainty. Greece part 1, 2, and 3. Fiscal Cliffs. Sequester. Taper. Etc. But not this time. Hindsight being 20/20, we know those emotional selloffs were great buying opportunities. It seems traders finally picked up on that trend and are no longer interested in selling the dip for Greece part 4. While that was the right call those other times, is it the right call here? The reason those other dips were buyable is because the emotional selling priced in the worst-case outcome. When reality turned out less bad than feared, we rallied in relief. But that is clearly not happening here as we rest less than 10-points from all-time highs while the Greek posturing and grandstanding drags on. Clearly this is anything but pricing in the worst-case outcome. What happens if the market assumes a rosy outcome and things turn out less well than expected? While the market will likely be right this time, sellers are not offering steep discounts to own this risk ahead of a signed deal. That means two things. First, if prices are not repressed, then there is less upside when things turn out okay. Second, what if the market gets this wrong? Limited upside and plenty of downside? Not a trade I want to make and it is best to let other people own this optimism. The more interesting trade will be if this turns into a buy-the-rumor, sell-the-news. Something to watch for in coming days. $AAPL – Apple continues to be fairly unimpressive. No reason to sell it, but no reason to buy it either. The big headline is management caved to Taylor Swift’s demand that they pay artists during the Apple Music’s free trial. While that will cut into earnings by some token amount, the free publicity this generates will more than make up for it. While this will build extra awareness for the streaming product, competing with Spotify is a much higher hurdle than Apple’s failed attempt to dethrone Pandora with Apple Radio. People didn’t change from Pandora and they won’t switch from Spotify. We can give Apple credit for trying, but this clearly isn’t the innovation shareholders are hoping for. $ALGN – Align continues to show strength following last week’s dramatic test of support. This is the fourth day the stock held well above $60 support and this is telling us buyers, not sellers are in control. Wednesday’s emotional selloff actually built a bullish setup because it chased off many of the timid owners with tight stops. Anyone still in this name demonstrated that their finger is not anywhere near the sell button. $EBAY – Ebay is recovering nicely from its test of $60 support. What was previously resistance is now a buying level for larger investors that want to accumulate this stock ahead of the PayPal spinoff. Another example of patience and discipline paying off. $FEYE – On the other side of the coin, FireEye touched $55 last week, but is down two-and-a-half dollars since then. Those that were riding the easy money wave higher hit a speed bump. There is nothing wrong with the stock or the story, but common sense tells us it is unreasonable to expect a stock to go up day after day. Last week I suggested we were approaching a good time to lock-in some profits and buy back in a little lower. We stalled at $55, now we get to see if the pullback slips under $50 support before bouncing. The great thing about those that locked in profits is it doesn’t matter to them if we find support or not since they are watching this weakness from the sidelines. It was a volatile Fed day with strong intraday moves in both directions, but the S&P500 only managed to hang on to a four-point gain by the closing bell. Volume was the highest in a week, but still repressed by the typically slow summer season. The Fed didn’t say anything that surprised us and is why we finished near where we started. It would have been foolish to expect anything else since every other Fed statement this year failed to break us out of this trading range. The policy remains accommodative, but expect a token rate increase before the end of the year. While many speculators are afraid of rate hikes, the far bigger shock to the system was ending the Fed’s bond buying program last year. Not only did we survive that, but the market is up more than 15% from when the Taper started. Going from 0% to 0.25% in short-term interest rates is trivial in comparison to ending a trillion-dollar money printing operation. The game of chicken in Greece continues as their politicians refuse to compromise and European leaders are reluctant to call their bluff. Some analysts claim the probability of a Grexit is now up to 50%. This is weighing on European markets, but the S&P500 is less than 2% from all-time highs. Similar headlines five-years ago sent shockwaves through the market, but this time the risk is far less since the financial system has had plenty of time to manage and hedge the risk posed by a Greek default. While we should expect some near-term volatility, the market holding near the highs tells us these problems in Greece are already priced in. $AAPL – Apple continues to underperform the broad market, closing in the red on a day where the indexes finished in the green. It seems some of the anticipation built up ahead of the Apple Watch’s release and the developer’s conference is slowly leaking out. 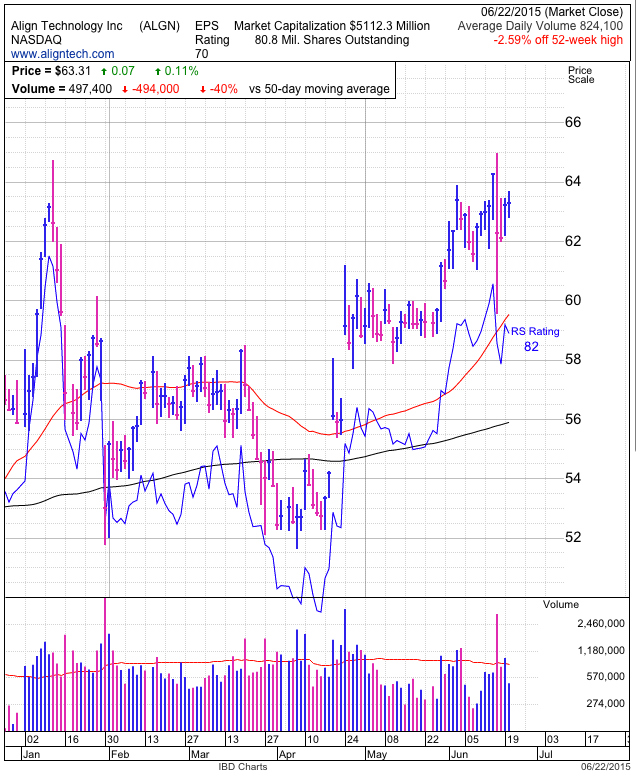 The stock slipped under its 50dma and is more than 5% off of its 52-week highs. 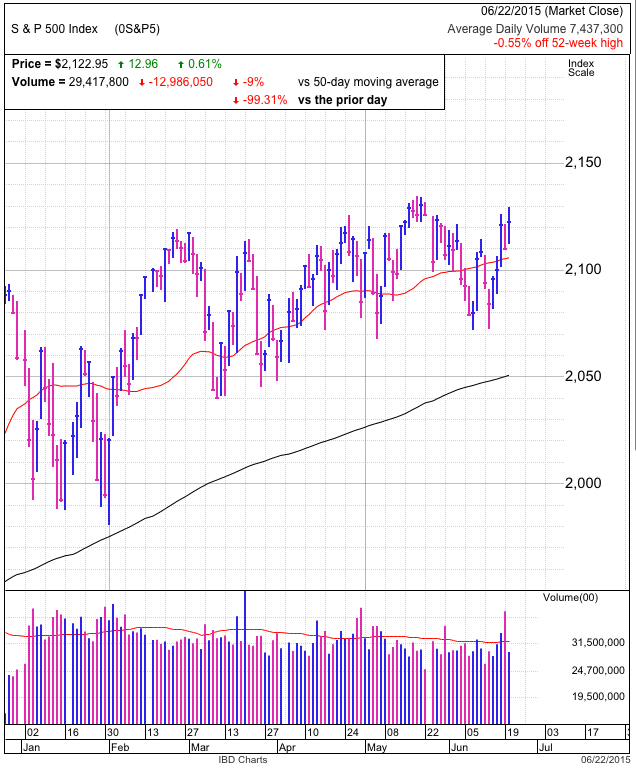 While there are no signs of an impending collapse, the stock might be settling into a sideways trading range. $ALGN – It was a dramatic day for Align as some of their patents came under threat. This dropped the stock $5 from the opening highs. While I’m not in the industry, I suspect ALGN’s branding and relationships with orthodontists are more of a moat than its technical patents. Long-term this won’t be a big deal and healthy competition is always good for business. But in the short-term, anything is possible as traders react emotionally. It is nice to see the price rebound and finish well off the lows. Three more closes above $60 and the storm will have passed, with the added benefit of scaring off the weak and emotional owners. Shakeouts like this improve the upside potential. But until then, treat this stock with extreme suspicion. There is a good chance today’s afternoon rebound will fizzle in coming days and we retest that $60 support. It was an interesting day as the S&P500 rebounded from yesterday’s selloff. The chart doesn’t suggest this bounce is any different from all the others that failed. The gains were modest, we closed under 2,100 resistance, volume was below average, and we continue making lower-highs. The notable exception is the situation in Greece deteriorated materially, yet the market rallied. We easily could have crashed a couple dozen points as Greece’s politicians refused to negotiate with European leaders. That’s what common sense says should have happened, so why didn’t it? The thing many speculators fail to understand is headlines, fundamentals, and technicals don’t move markets. Only people changing their outlook and making adjustments to their portfolio drives price. It doesn’t get any more simple than that. Shifting expectations and the resulting buying and selling move prices, period, end of story. Puting today’s move in context, stock owners read the Greek headlines, shrugged and went about their business. The reason we didn’t see the “common sense” selloff is every owner who fears the Grexit is already out of the market. When there is no one left to sell the news, it no longer matters. Today’s price-action is telling us Greece isn’t a big deal anymore. Without a doubt these headlines will continue to drive volatility, we could remain range-bound, and will likely see a kneejerk selloff when Greece finally defaults and gets the boot, but today’s trade tells us this will be a short-lived move since most of the Grexit sellers are long gone. The way to trade the volatility is to continue buying the dip. While this market will eventually crash, it won’t be because of something everyone is talking about. Remember, people don’t get hit by the bus they see coming. $AAPL – Apple is mirroring the indexes and it’s fate rests with the rest of the market. Last week’s developer conference came and went without a major catalyst and it will be a while before we have another one. There is no reason to sell the stock, but there isn’t much to get excited about either. $EBAY – Fairly dramatic move today. The day started with a bang as the stock popped a dollar and a half at the open, but the move quickly fizzled and we finished with a much more modest fifty cent gain. While I’d prefer to see more constructive price-action than this intraday reversal, we remain above support and today’s pop shows the explosive potential remains to the upside. We are close to the breakout point and we need to watch this one closely, but it isn’t time to pull the ripcord yet. Failing to hold $59 and we will be forced to reconsider. $FEYE – FireEye continues to ramp up. While it is exciting to see these gains pile up day after day, owners should be shifting to a more defensive posture. We’re close to a 20% gain from the breakout point and it wouldn’t be a surprise to see the stock pause near $55. While it could easily continue racing higher, only a fool would be disappointed by locking in a 20% gain over a few weeks. A more aggressive stance is moving up a trailing stop and letting it ride. We have modest support near $50, but there is a good chance a near-term pullback will under cut $50 for no other reason than chasing off all the owners with a stop under $50. 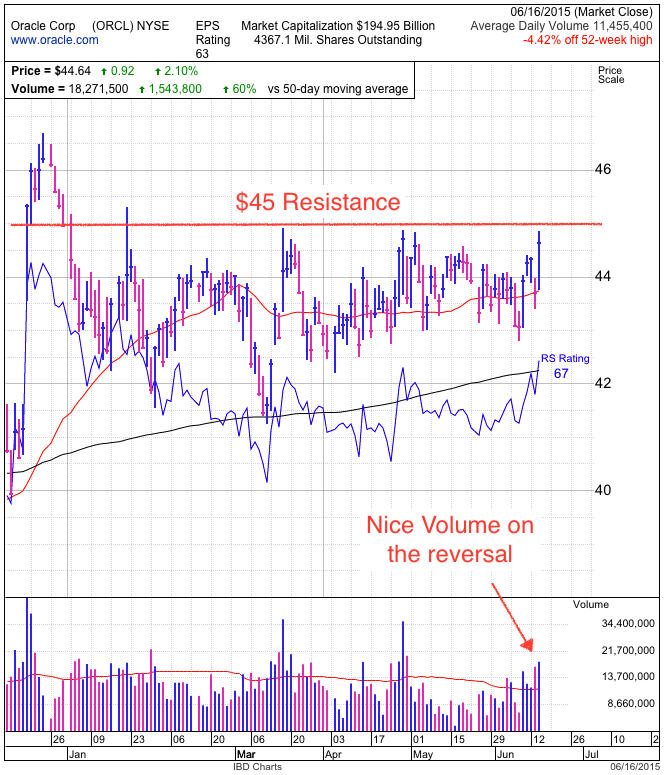 The proactive trader that locks in profits near $55 could reenter following the $50 undercut and bounce. $ALGN – Align is marching ahead and pennies away from eclipsing January’s intraday highs. At that point virtually everyone in the stock will be sitting on profits and excited to see them continue growing. Confident owners keep supply tight and prop up prices. An Ebay style pullback to $60 is possible so it is riskier to chase if someone isn’t involved yet. $ORCL – In the big-cap space, Oracle is getting interesting. Today’s 2% gain on 60% above average volume makes this worth a look. We’re on the verge of breaking through the upper end of the $45 trading congestion. After that, the only thing holding us back is last December’s $46 highs. Clear this and we’ll be making multi-year highs. While not as exciting and fast-moving as some of the smaller growth stories, profits are profits and some slow money offsets the volatility from more speculative holdings. The S&P500 finished flat after modest moves lower and higher failed to stick. Volume continues to be below average as we slip further into the summer doldrums. While economic indicators, corporate earnings, mergers, Fed statements, and other headlines come and go, the market remains stuck in neutral. The biggest item hanging over us is the impending Greek default if a deal cannot be brokered in coming weeks. It seems many with cash are waiting for a resolution before they feel comfortable buying stocks near all-time highs. And so we trade sideways while we wait for the situation to unfold. A common saying is you never get hit by the bus you see coming, and that clearly applies to this Greek debacle. The Grexit has been in and out of the spotlight for years. While the global financial system was vulnerable early on, most Greek debt has since been absorbed by the ECB and other European nations, leaving the wider private sector largely immune to a Grexit. While stock prices are held back by a fear of the unknown, the Grexit will actually be a bullish catalyst once it turns out far more benign than most fear. But the market trades on perception, not reality, so we should anticipate near-term volatility as this standoff comes to a head over coming days. But when scared owners start offering stocks at steep discounts, that is our opportunity to step in and profit once the storm passes. $AAPL – Apple opened weak the day after its developer conference keynote failed to excite investors. But we knew this was coming. Short-term traders can trade around near-term volatility driven by broad market weakness, but the iPhone story remains intact for long-term investors as long as $122 holds. If we slip to this level, we will have to watch the situation more closely and reevaluate. 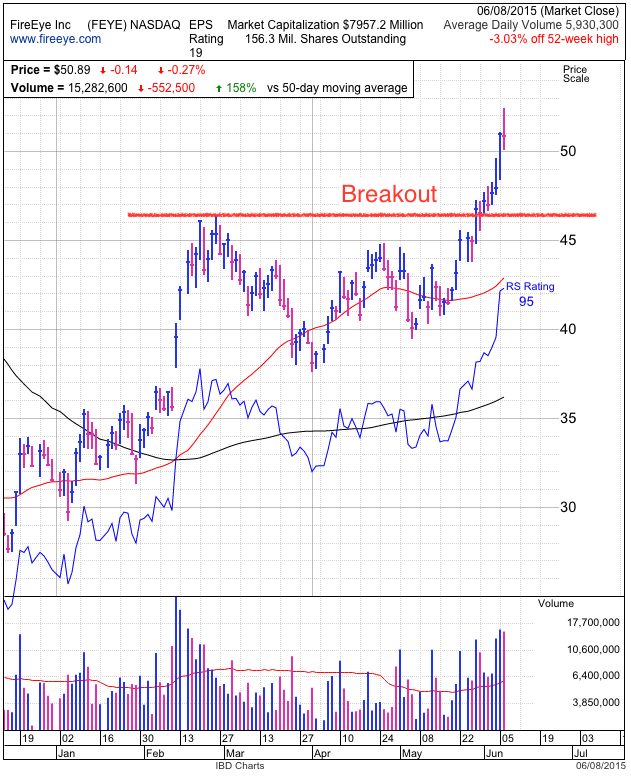 $EBAY – Ebay is testing the breakout level, giving those that missed the initial move the opportunity to get in. Of course given human psychology, it is far harder to buy the pullback than the breakout even though the real risk is actually reduced as we slip a few points from the highs. The key is holding $58/$59 support. For the breakout or dip buyer with a $60ish entry price, this represents a fairly attractive risk/reward, but for those that chased the stock up near $63, the risk is quite a bit larger. $FEYE – FireEye is doing a good job holding recent gains, but it is up 10% from the breakout point and anyone tempted to chase only needs to look at EBAY for what can happen if you show up late to the party. Either wait for a pullback, an alternate entry point, or simply look for another trade. There is no need to chase, especially given the recent weakness in the broad market. 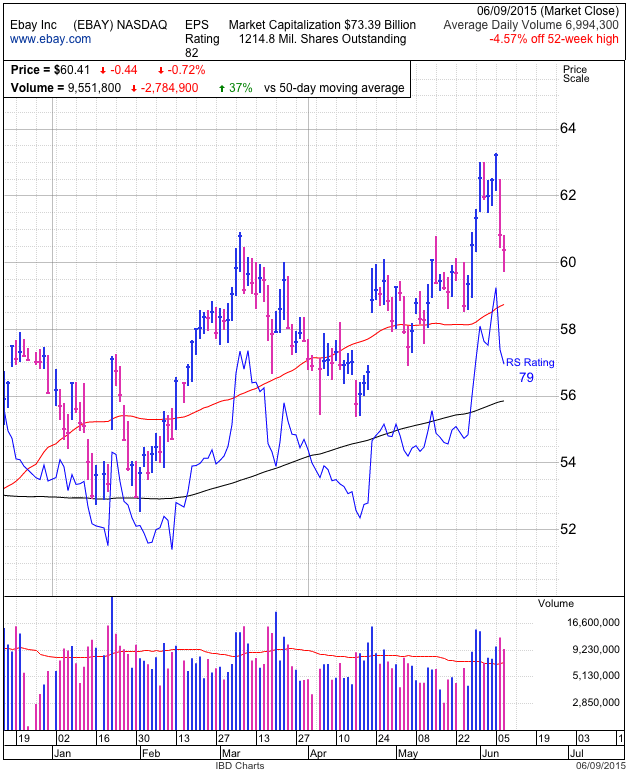 $ALGN – Align is also pulling back as the wider market softens. This continues to be an interesting story, but very few stocks can stand up in the face of a weak market. As soon as we get the green light from the market, these individual stocks will start trading strong again. The selloff continues as the S&P500 falls for the third consecutive day. This pushed us to 2,080, a level that’s acted as both support and resistance multiple times this year. While not as psychologically important as 2,100, it was meaningful enough to arrest the slide. The question now is if this puts the worst behind us. Volume was the lightest we’ve seen in weeks, showing the technical weakness didn’t scare many owners and the dip was more due to a lack of demand than a surge in supply. While it is nice to see owners remain confident, capitulation bottoms form when owners panic and dump stock at a steep discount. Clearly that didn’t happen today. That means either we see a slow and methodical rebound from here as tight supply trumps light demand, or we plunge lower and trigger that emotional capitulation bottom. Slow climb higher or sharp selloff lower? The risk/reward seems pretty clear. But in spite of that, I continue to be bullish medium-term for all the reasons I listed in last week’s posts and am looking forward to profiting from a near-term emotional drop in prices. For those with long-term portfolios, don’t let this noise or price-action shake your resolve. $AAPL – Apple had their dog and pony show and just as expected, didn’t announce anything all that interesting. Minor updates to OS X and iOS and a music streaming service that will no doubt prove as wildly successful as their two-year old iTunes radio. What? You never tried iTunes radio? Yep, exactly like that. Apple is a handset maker and as long as the iPhone continues to sell well, you can ignore the iPad, iWatch, iTV, iRadio, iStreaming, iMac, iCar, and all the other side projects they have. The stock lives and dies by how many phones they sell. Which is why the most noteworthy development t0day was ATT’s decision to stop offering subsidized phones through the Apple Stores. This will be especially critical if other carriers follow suit. Between the slowing evolution of new must have features and the end of phone subsidies, we could see the phone upgrade cycle stretch from two-years to three-plus as consumers have to pay more and get less in return. Since the global high-end smartphone market is saturated (those who can afford a $600+ phone already have one), a slowing upgrade cycle will be a big headwind once the iPhone 6 upgrade surge runs its course. While not a today story, it is a material concern for long-term owners. $EBAY – Ebay was smacked down by the broad market and shows why it is risky to chase a stock extended from the breakout. But in spite of today’s nearly 4% dip, the breakout is still intact and isn’t under threat unless we fail to hold $58. $FEYE – FireEye had a strong open but gave up those gains through the day under the weight of the weak broad market. The breakout still looks good, but with a sky-high valuation it is subject to more volatility if the entire market hits a rough patch. $ALGN – Everything I said about Ebay equally applies to Align, even coincidentally enough, the $58 price level. 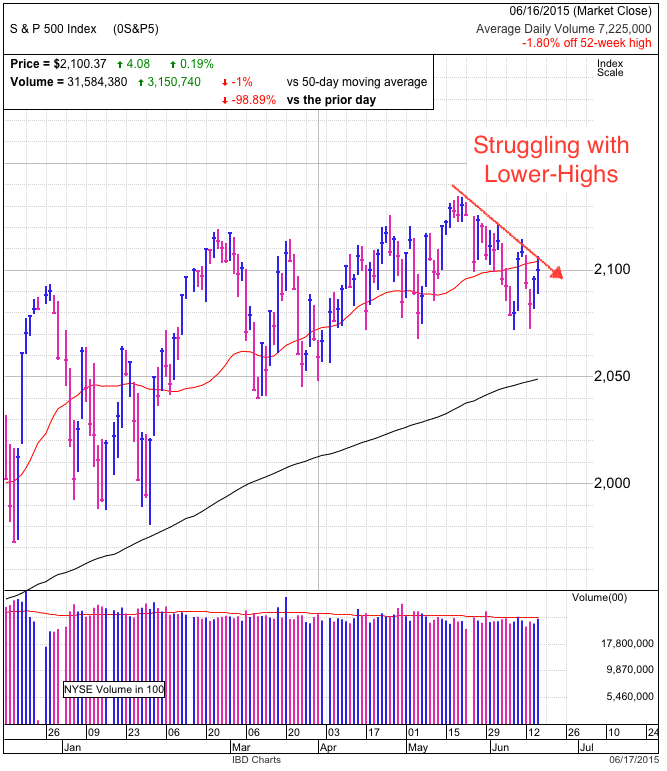 It seems like the broad market and individual stocks could see some near-term weakness, but this will be yet another buyable dip. Those with stock should buckle down and prevent their emotions from getting the better of them. Those with cash should remain patient because we will likely see better prices in coming days. The indecisiveness continues as yesterday’s attempted breakout becomes today’s breakdown. Early strength on Wednesday convinced many the market was finally ready rally, but this morning’s dip under 2,100 spins the exact opposite story. Can we believe this is the start of the real selloff, or is it just another head-fake? Cutting through the 50dma and closing under 2,100 will prove insightful over coming days. Either it triggers an expanding wave of emotional, technical, and stop-loss selling, or it bounces as quickly as Wednesday’s upside breakout fizzled. The thing to be careful of with these intraday moves is they are primarily driven by the small subset of day-traders. What they lack for in size, they more than make up in volume. But their limited account size prevents them from driving sustainable moves. While they can kick things off, they don’t have deep enough pockets to keep them moving. Only big money managers have the dollars behind them to keep the ball rolling. And so far this year big money hasn’t flinched following these countless breakouts and breakdowns. When the institutional bulls stay bullish and the institutional bears stay bearish, every attempted move fizzles and we quickly return to the status quo. While today’s dip didn’t feel like capitulation and we likely have a little more downside left, we should be getting ready to buy the dip, not joining in the herd’s emotional selling. $AAPL – Apple’s selloff today was less than the market’s and shows owners want to continue holding ahead of next week’s developer conference. The thing to be wary of is if this turns out to be a buy the rumor, sell the news event. There is no reason for the long-term holder to worry about these minor gyrations, but a more nimble trader could take profits ahead of the conference and buy back in at a discount a few days after. $EBAY – Ebay’s breakout is on firm ground as it bucked the broad market’s weakness and finished in the green. That strength tells us this breakout is the real deal and we should keep holding. It was another meaningless day for the market as it remains stuck in neutral. 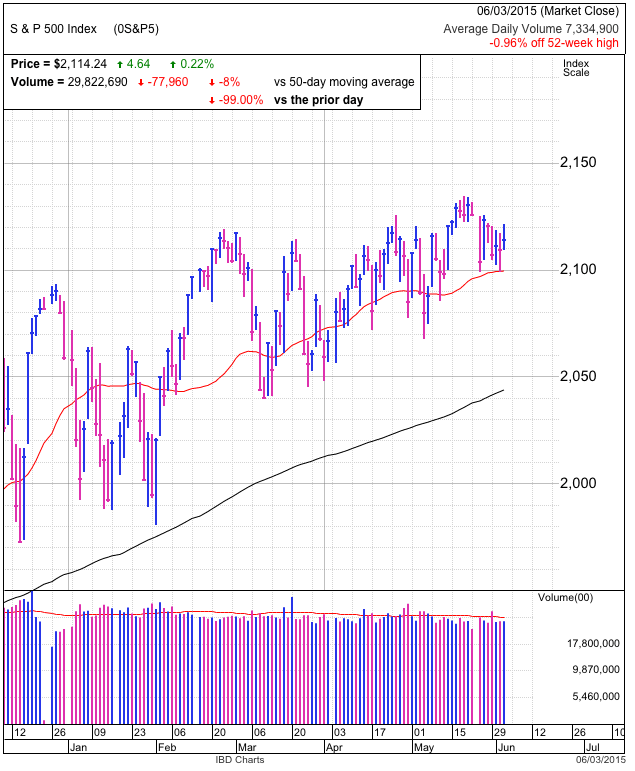 The S&P500 finished inside a 20-point range for the seventh consecutive day. While some claim this is boring, listless trade. Reality is a lot of passion is hiding under the surface. Given the headlines out of Europe, Asia, Fed, and our economy, plus stocks at record levels, there are few traders yawning from boredom. Most are passionately arguing their opinion that this market is either overvalued and on the verge of crashing, or in the early stages of another 90’s style bull run. The market isn’t idling in neutral because nothing interesting is going on, it is stuck because bulls and bear are pulling so hard from both ends. If we listed of all the reasons this market should selloff, it would take several sheets of paper. But I suspect most would struggle coming up with more than a handful of fundamental drivers for us to continue rallying. Yet here we are at record highs. For many investors, this obvious skew is all the reason they needed to dump their stocks ahead of the imminent correction. But as the contrarian, I’m left wondering why this market is so strong when the news is so obviously bad. The thing most people forget is markets don’t trade news, fundamentals, or technicals, they trade opinions. No matter how bad the news, if we run out of sellers, prices rally. Opposite is true when we run out of buyers. Trade people, not news. A lot of the reasons we keep stalling above 2,120 is because those with cash are afraid of Greece dropping the Euro. We’ve been conditioned by years of articles about what a disaster that would be. But here’s the thing, markets are only vulnerable to the unknown. Since every wannabe investor hanging out in Starbucks is talking about what’s going on in Greece, we can safely ignore it. That doesn’t mean these events won’t drive near-term volatility, but that we can take comfort in knowing it won’t cause the next market meltdown because there are so few left to sell the “surprise” headline. I’ve been constructive on this market for a while, but stalling near the highs for over a month is a concern. Those with cash are not in a mood to buy because they are afraid of Greece, rate hikes, and a sluggish economy. But clouds of uncertainty always dissipate and the best time to buy is when everyone is most uneasy. The biggest bullish catalyst in front of us, and yes I said bullish, is Europe finally kicking Greece out of the Euro. By the time traders realize Greece is the catastrophe that never was, it will be too late to buy the dip and all those reluctant buyers will be forced to chase this market higher. Long-term investors should ignore all the noise, but more nimble traders can make money buying discounted shares from panicked owners if prices stumble in the near-term. $AAPL – Lacking any headlines, AAPL is mirroring the indexes. There is a chance we could see a small pullback next week after Apple fails to announce anything new and exciting at its developers conference. But the disappointment will likely be short-lived. $EBAY – It was a flat day for EBAY as it continues digesting the recent breakout. But the longer we hold above the breakout, the more likely it will stick and continue higher once all the new-high profit-taking is behind us. $ALGN – Added nicely to its recent breakout. The big psychological and technical test will come when it runs up against $65, a level it failed to overcome at the start of the year. While we should expect a pause, or even pullback, as many sell and short the highs, there is no reason to join the selling as long as we stay above the buy-point. $FEYE – Keeps edging higher, but this one has a longer road to hoe since it is well off the highs. 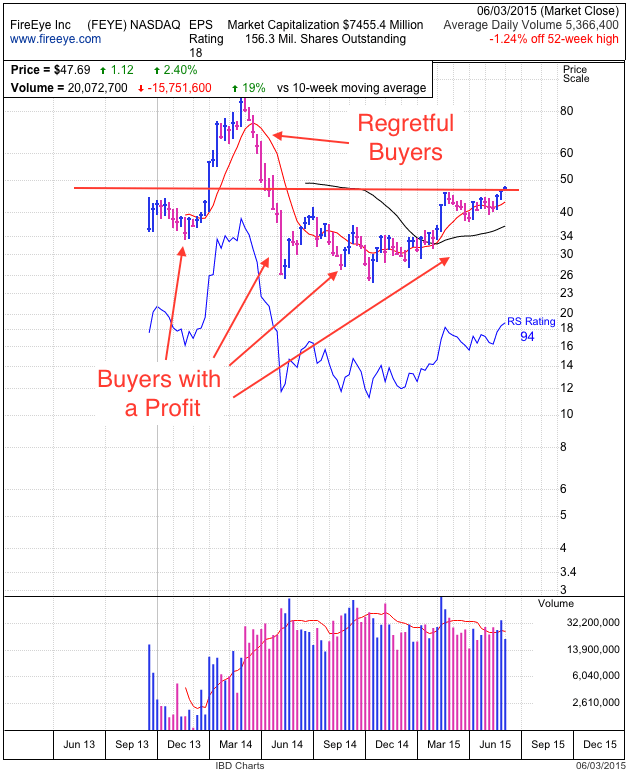 It will continue to encounter selling pressure from regretful owners as it climbs higher, but this recent breakout pushed us clear of the post-IPO consolidation and all those buyers are now sitting on profits. While we are still 50% off the highs, most owners are sitting on profits and more comfortable waiting for higher prices.